Wine Shops: Why do some wineries get it so wrong? Wine shops are weird places. There aren’t a lot of other businesses where you can go, consume some of the product for free (or nearly free), and buy (or not buy) some of said product. Test driving cars or trying on clothes are both perhaps the closest, except that in both cases the pr oduct doesn’t get consumed by the consumer in the process. Nobody gets offended if they aren’t allowed to eat the car. But selling cars is similar to selling wine in that the knowledge needed on the part of the sales person to sell the car needs to be reasonably good. If you don’t know very much about cars, you probably won’t be able to sell them very effectively. So why are wine shops still staffing their front-end tasting bar with people who have little knowledge about the wines they are selling or even wine in general? I once asked a person behind the bar if they knew how many vintages the winery had ever done of a particular sparkling wine. Any of those answers above are perfectly acceptable. I didn’t think that it was a particularly difficult question to ask. I knew there hadn’t been that many vintages of it made previously. I had started a vertical of this wine at home and I wanted to be sure that I hadn’t already purchased it before. I knew I had 3 bottles from three previous vintages already at home but wanted a confirmation that this was or was not a newly released vintage. Speaking of the back label on a bottle of wine. The back label can have as little or as much information on it as the wine maker or owner deems appropriate for their house style and branding. It does not contain all of the information that there is to know about a wine, nor does it replace the training needed to pour the wine at the tasting bar. Will I?? I’m going to taste all of that? Wow, I didn’t know that. Thank you so much for tasting the wine for me. Why should I even bother now? A) … not taste any of those aromas and feel stupid about it, thinking that they don’t have a good palate. They will effectively give up on trying to focus their sense of taste because they can’t yet perceive the aromas that you said that they would. This is the equivalent of telling a child in the school choir to just mouth the words because they are singing out of tune. That kid will grow up believing that they can’t sing or are tone-deaf and will never try again for the rest of their lives. This is not an exaggeration, this is proven fact from the realm of musical education. B) … taste everything that you mention, love it, and then go home with a bottle where they will quickly notice that it “doesn’t really taste like it did at the winery.” Due to travel shock, stemware differences, or environmental differences (odours, etc), the sterility of the wine shop can’t easily be duplicated in a home setting. Where you drink your wine will affect how you perceive it. You mean you’ve never had a glass of the wine that you’re selling? Perhaps you should choose another kind of job. Stories of your own experiences with a particular wine are the real gold in the wine shop. Stories are interesting and they are unique to each person behind the bar. They do not lead the customer on with “aromas” and “flavors”. They can be funny or informative. Wine shop customers LOOOVE hearing about wine shop staff parties. They think we live THE LIFE here in wine country (we do, right? ), drinking wine all the time (well…), and looking at the beautiful views of the valley from our decks all year in the unbroken sunshine. That’s why people have driven out of their way to buy a bottle of wine that they could actually have purchased at a liquor store or VQA shop instead. But no, they drove all that way to visit you and it is your job to give them a good experience that goes beyond the back label. It comes down to staff training. Most of the training that I’ve seen wineries do is just sad. Wine knowledge is not an easy thing to convey to people who are insecure with their own understanding of wine. The best thing to do is to simply not hire those kind of people. If you were hiring a car salesman, don’t hire someone that doesn’t know anything about cars. Unfortunately the reality of the labor situation in the Okanagan is that this is not always possible. A lot of wineries that I’ve seen so far this summer are cripplingly understaffed. When you need hands on deck, sometimes wineries have to make do with what they have been offered. Even with a staff that is short on wine knowledge, there are ways to make the most of your team’s skill set. Even a little team building will go a long way. Take a wine tour to visit other wineries. See what they do right or wrong. Talk about it. Did that wine shop seem welcoming? Was that woman behind the bar dressed professionally for their winery? Why or why not? What can our wine shop do different than what we saw on our wine tour together today? The other obvious (and easy) thing to do with new staff is to taste the wines with the wine maker. Not the winery owner, not the marketing person, not the tasting room manger, the wine maker. Nobody knows the wines better than they do and this is a winery’s best resource for teaching “wine 101” to the people who the winery is trusting to be their face for the season. Give wine to your staff. Some wineries I’ve worked for are downright parismonious with their own wines when it comes to providing them to staff. There has to be a few perks to working at a winery and this is one of them. But it’s important because it allows the staff member to have their own experiences with the wines at home so that they can use those experiences to sell it in the wine shop. “Oh, I had that Riesling with a pulled-pork sandwich last week. It was so good…” It is selling the experience and not a wine that simply tastes like peaches, melons, or vanilla. In short, hiring staff and giving them very little training is an obvious quick and easy way out. You might think that you are saving money by not giving them wine, not hiring a consultant to train them, or not sending them out on a day-long wine tour. Ultimately however, you will lose more money in lost sales or opportunities than you will save and you will likely never even know it. Customers will be able to figure out pretty soon that if you’ve taken the quick and easy way out with your staff. Maybe you’ve also taken the quick and easy way with your wines as well? Customers can will figure that out pretty quickly too. They have done it. The Golden Mile Bench can now be used on wine bottle labels starting pretty well right away. It will be seen as “BC VQA Golden Mile Bench”. The wineries that have vineyards within the boundary are CC Jentsch Cellars, Checkmate Artisanal Winery, Culmina Family Estate Winery, Fairview Cellars, Gehringer Brothers Estate Winery, Hester Creek Estate Winery, Inniskillin Okanagan Vineyards, Road 13, Rustico, Tinhorn Creek Vineyards, and Willow Hill Vineyards. Agriculture Minister Norm Letnick made the announcement today at Tinhorn Creek Vineyards. This is a big deal. It’s a big deal because they succeeded after 6 years of trying to clearly and scientifically delineate a unique area for growing grapes. Part of the reasons for that was discussed on Monday evening at Okanagan College’s Speaker’s Series when the topic for discussion was “Vineyard Soils of the South Okanagan: Defining the Okanagan Terroir” by Scott Smith and Pat Bowen from the Pacific Agri-Food Research Centre . In fact, based on geological models, the Okanagan could be further into other distinct regions along with the Golden Mile Bench: Kelowna, Penticton-Summerland-Naramata (all together), Okanagan Falls, Vaseaux-Oliver, Black Sage Bench-Osoyoos. Very interesting to see all of this complex information masterfully distilled into one short seminar by Scott Smith. It brought a good deal of discussion on various topics including marketing. The most moving portion of the presentation however was the projections for climate change where it became clear that the Okanagan will be changing and quite drastically. The audience was a mix of Okanagan College students and interested industry people. Perhaps there will be another announcement from another potential sub-GI in the valley’s future? 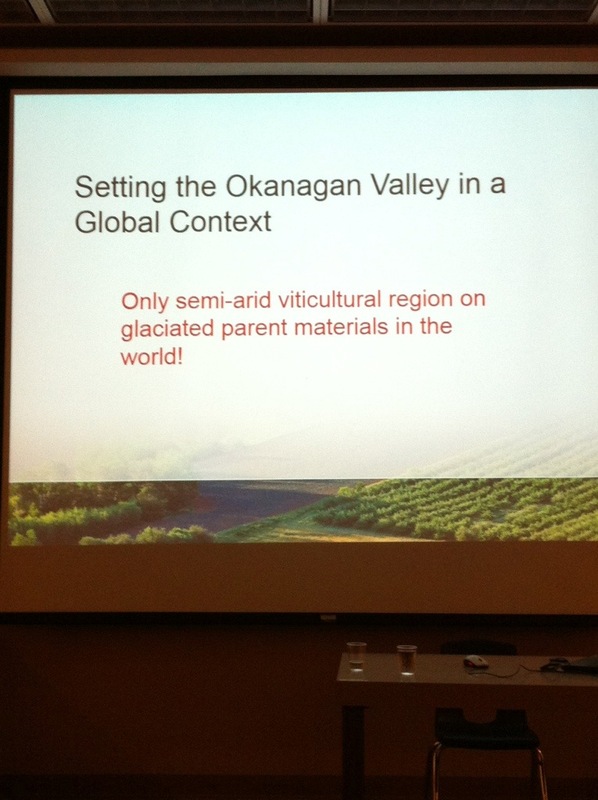 As a summary, Scott Smith added what is in effect a definition of our grape growing region.